None of the information on this website is meant to alarm or scare you. It is, however, intended to help you understand and confront the potential seriousness of gaming addiction. The dangers and consequences are real. If your child is struggling with gaming disorder and it is becoming a consuming part of their life, then it’s important to get them the help and support they need. If your teenager spends a lot of time playing video or computer games, try to find other things for them to do when they’re at home. If your child is creative or artistic, help them develop that talent or ask for their help with a project. Let your child redecorate their room. But try not to resort to increasing chores or responsibilities around the house; that’s likely to make them feel like they’re being punished. Alternatively, consider helping your teen find things to do that will get them out of the house. Again, if your child is creative or artistic, enroll them in a class or two that will help develop that particular talent. If they like to play sports, sign them up for a league. You don’t want to over-schedule your child, but you do want to encourage them to develop relationships offline. Because addiction, by definition, means that a person is unable to control their behavior, your child will need you to set some clear boundaries around gaming. Sit down and talk to them. Be honest about your concerns and why you’re setting rules. Ideally, you and your child can agree on some guidelines. Getting there may be challenging, but they will be more likely to adhere to the rules if they feel that they helped set them. Of course, setting rules won’t change addictive behaviors unless they are specific and enforceable. If you’re limiting your teenager’s access to gaming, you have to limit access to gaming equipment like computers, too. This may take some creativity and could be inconvenient for the rest of the family; be sure all family members will back you in your decision. 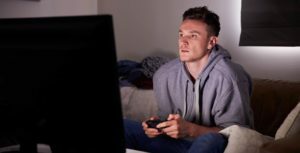 If your teen’s gaming has already progressed to the point of addiction, the road back won’t be easy. The entire family will need to be as supportive as possible. You and your teen are likely to take some steps backward along the way, and that’s to be expected. Just don’t give up. Continue to encourage your teen and acknowledge even the smallest victories. Gaming addiction often occurs alongside mental health problems. Parents must be sensitive and take into account the possibility that the escape offered to children by video games can sometimes (but not always) be a sign of other underlying issues. Researchers are still trying to uncover the relationship between gaming addiction and other mental health problems. However, impulsivity and poorer social skills appear to increase the risk of children developing a gaming disorder (1). Meanwhile, the link between gaming addiction and issues like depression has been the subject of debate. It has been proposed that the two may form a vicious cycle in which excessive use of video games contributes to depression, which in turn causes the gamer to retreat further into their compulsive gaming habit (2). The emerging research underlines the need for parents and caregivers to be patient and supportive in their approach. If nothing else is working and you think there’s a problem, then it’s best to find help as early as possible. You may want to consider getting professional help for your teenager. Someone who has experience dealing with addiction could help your teen process the thoughts and feelings that initially led to the addiction, as well as the emotions they have felt since admitting there is a problem. The inclusion of gaming disorder in the World Health Organization’s diagnostic manual will help to stimulate discussion and acceptance as we move into an era in which problematic patterns of gaming behavior become more common. Indeed, there is an increasing number of therapists available today with experience in treating adolescents with gaming addiction. These professionals are a great place to start in confronting the problem head-on. Remind your child, regardless of their age, that gaming addiction is not a source of shame or embarrassment. Millions around the world struggle with similar difficulties. It won’t necessarily be easy to sell your child on the idea of speaking to a therapist but it’s important to trust your instinct if you see signs of a serious problem. It is difficult to strike a balance between assertive and overbearing when broaching the issue. However, persistence can be powerful when coupled with the message that you truly care and want what’s best for the affected child. So don’t give up, and don’t be afraid to reach out to others for a helping hand!